Folding white board screen, Flat Screen Cabinet, Meeting Room Couch, Desks, Conference Table, Standing Height Meeting Table with White Board Top. On first step out of the elevator it is clear this is no ordinary office. 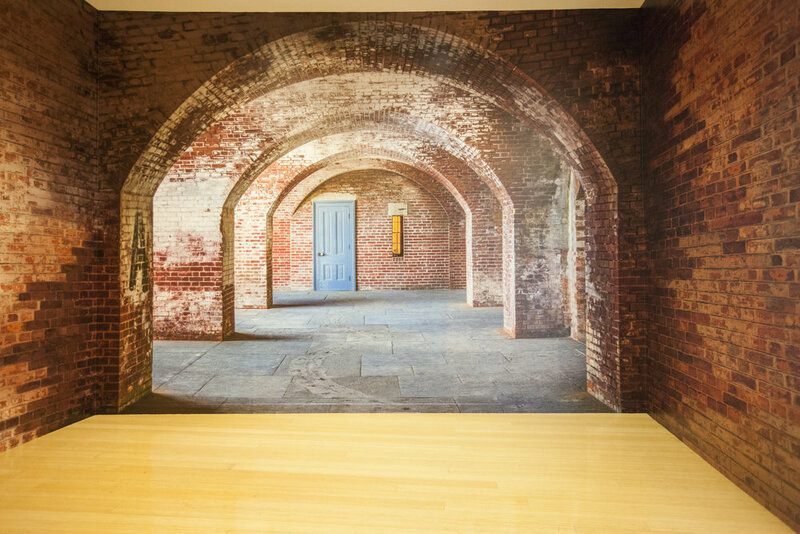 The photo wall wrap of the historic Fort Point in San Francisco gives this entry way a fun sence of depth while nodding to its name sake. The office pallet is all natural colors of rusty metal, wood tones and contrasting sky blue. The colors of the office are drawn from this photo, creating a cohesitve feel throughout the space. As you round the corner of the elevator lobby, the hall leads you to a private meeting space flanked by offices and conference rooms. Now with this operational glass wall it has the ability to be fully closed off with a door, or a fully open space. Even the tiny copy room has tones of the the office colors with wooden shelves, rusty metal and a sky blue wall. At the end of the hall, the main meeting room. This multi functional room hosts small events, power meetings with clients and staff sessions. The flat screen cabinet is closed off to become a floor to ceiling white board. A test hang in the fabrication shop assured the hanging system and doors would work well in the tight, built in space. 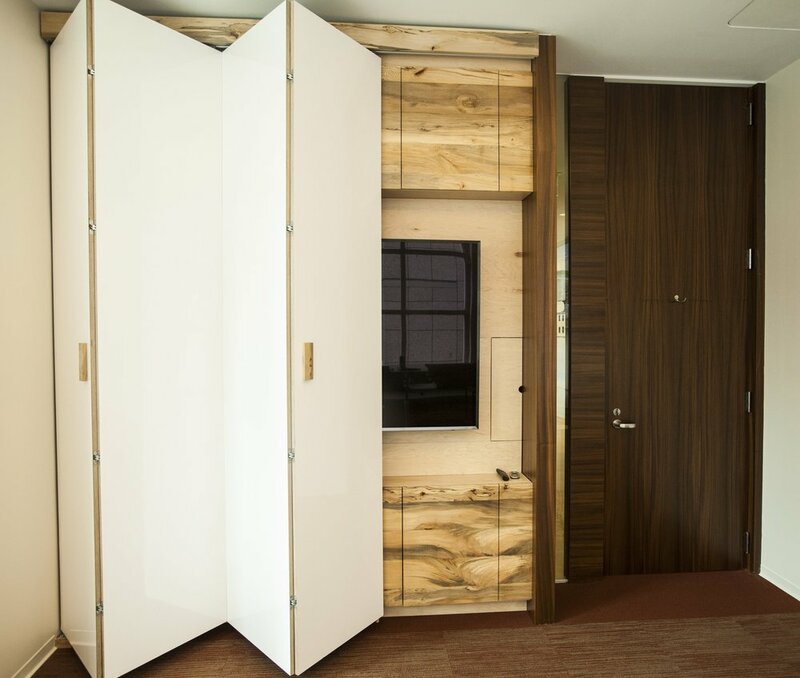 Accordion opening door reveals a beautiful sycamore paneled cabinet behind with storage and a large flat screen. The rest of the main meeting room is filled with multi toned carpeting of rusty red, grey and blue. Our custom couch wraps the room and the standing work table sits by the large window. 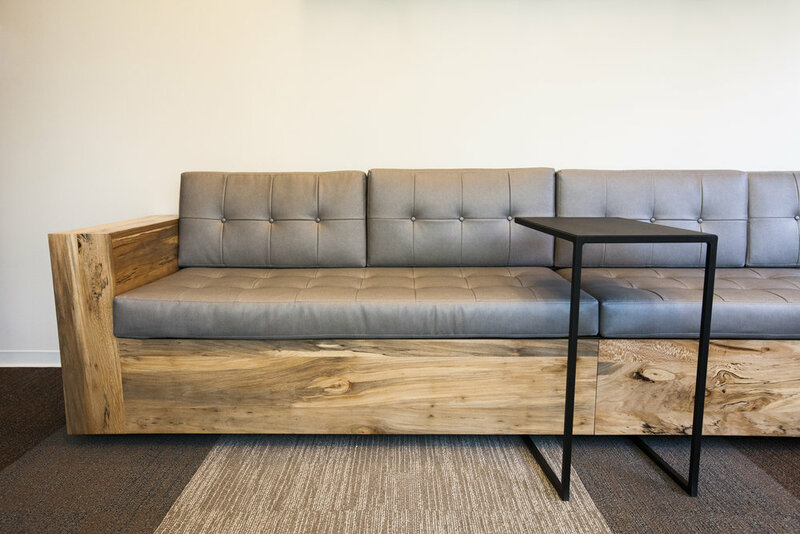 Our sycamore clad modern couch is a simple, classic and functional design, created to fit perfectly into this space. The grey leather cushions with the sycamore wood surround is a wonderful compliment to the rusty grey carpet. A standing height work table by the window allows multiple kinds of meetings in this sun light room. The standing height work table has a flip up top that turns the table into a standing height white board. The white board can be used in either configuration, as a table top or turned up vertically. In the shop, we're working on the built in conference table. A table coming off a wall cabinet unit, the whole piece built perfectly into the space. Sycamore and Maple woods make the face and cabinetry of this piece. Almost complete, the table top get's its final detailing before being sent for final finishing. In place, the simple classic style works perfectly in the space. 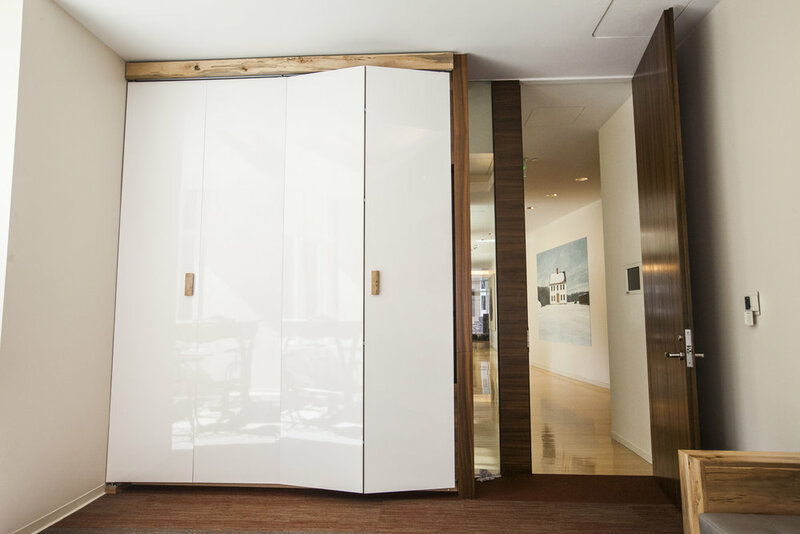 Cabinets that have beautiful grain matching can be seen in the conference room and through the glass walls. 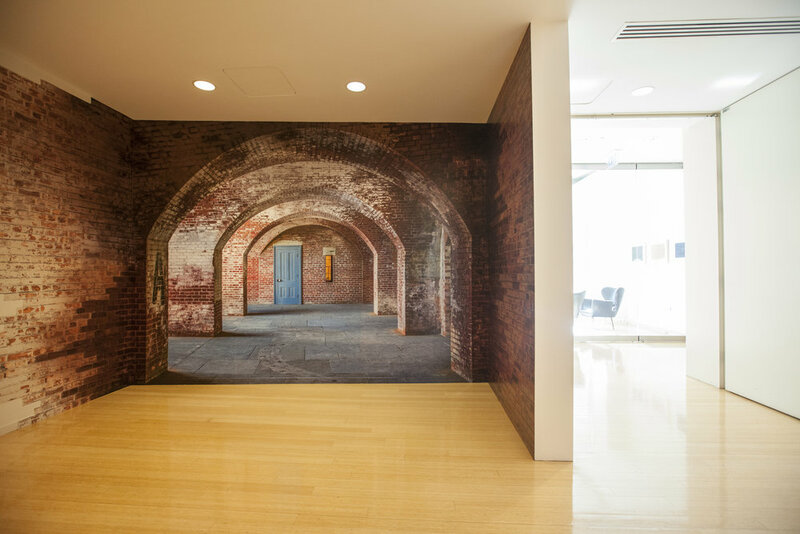 Small details make the space: The brick slowly bleeds onto the adjoining wall. The carpet plan makes great use of the product line that comes in these different complimenary colors. The carpet in place brings new life to the original wooden walls. Light filled and private. Now the office has more functional space and a refreshed look. An un-obtrusive office re-model for an occupied space. New carpet, paint, built in furniture details and graphical elements brought new life into this office. Being a finance professional office with high end clients, a certain level of professionalism needed to be maintained. But the desire to have interesting elements in their office and stand out from other small finance offices was there as well. 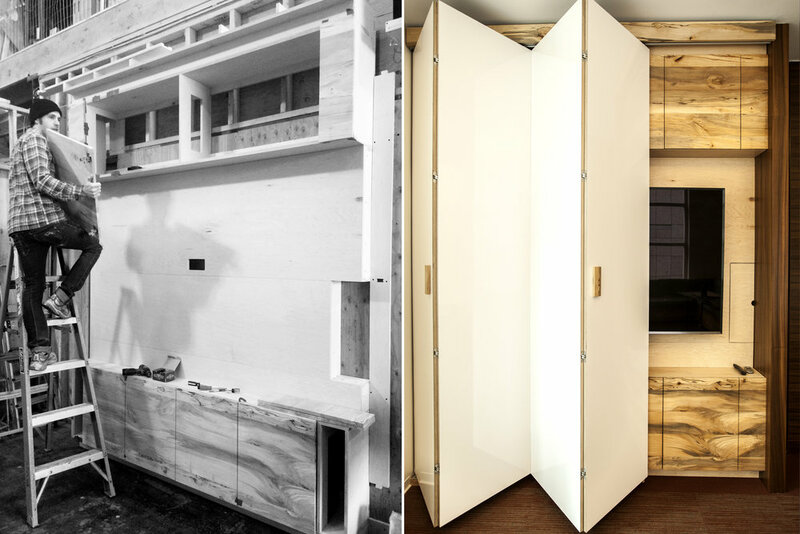 Bringing in custom elements designed specifically for their needs helped make this renovation unique to this client.